My last letter (1/05/14) to Congressman Clarke is being faxed along with this letter. There has been no response to this letter. I’ll be more than happy to travel to Washington DC to explain why the American Journal of Physics should retract the article, and why it is your responsibility to make the AJP aware of its obligations. I faxed a letter on March 20, 2014 to 202-228-3027 (11:45 AM) and 202-228-3028 (11:32 AM) concerning my communications with the Rose Gottemoeller (Under Secretary of State for Arms Control and International Security) and Yvette Clarke (D-NY, 9th district). In telephone conversations with your staff at New York City and Washington, DC, I learned about your procedure for opening up a case and assigning a caseworker. I hope this happens in my case. I’m looking forward to explaining this scandal that disgraces and endangers the United States to someone from your office. I spoke to Senator Schumer’s NYC office this afternoon to inquire about my correspondence with his office. I am under the impression that Senator Schumer has an ethical duty to assign a caseworker to my complaint against the State Department in connection with my request for a personal interview with Rose Gottemoeller. I want to explain to the caseworker why an article (“Entropy and evolution”) published in the American Journal of Physics is fraudulent and should be retracted and why the article endangers the United States. I had such a meeting with the President of the Providence College Corporation (Fr. Brian Mulcahy, O.P.) on September 9, 2013. I accused the physics and biology departments of Providence College of helping the American Journal of Physics cover up the mistake it made in publishing the article. Fr. Mulcahy indicated that he would investigate my allegations, however, he has not told me what the results of his investigation were. Fr. Mulcahy is located in New York City (212-737-5757). Attachments: Letters dated March 20, March 27, April 3; email dated April 1; two certificates of mailing. I think the best way to tell the story is in two parts. The first part will be pure science and the next part will come in a second fax and be a description of my interactions with various people. The theory of evolution is that microscopic organisms evolved into whales in a period of 100, 000 decades (common descent). This gives rise to the question of what caused it, and scientists invented the theory of natural selection acting upon innovations. The old paradigm for innovations was natural selection, but the new paradigm, at least according to James Shapiro of the U. of Chicago, is natural genetic engineering. Whatever the paradigm, natural selection only explains adaptation (microevolution), not common descent (macroevolution). Evolutionary biologists always speak of adaptive evolution. The only theory that even attempts to explain the complexity of life is the theory of intelligent design. Unfortunately, there is no evidence for this theory. What advocates of ID regard as evidence is really evidence that the universe is not intelligible. To make their theory look better, ID advocates compare their theory with natural selection. Atheists go along with this scam because they don’t want to admit that ID is a better theory than natural selection, in some sense. As a result of this scam, many non-biologists think 100,000 decades is a long time and the difference between a bacterium and a whale is not so great. They think natural selection explains the complexity of life. One measure of the complexity of life is the primary structure of a protein. Hemoglobin, for example, is made up of 600 amino acids of which there are 20. Sickle-cell anemia is caused by one amino acid being the wrong one. In trying to understand where proteins come from, biologist calculate the probability of getting a protein by the random selection of amino acids. This probability is very small and it causes some people to think the origin of life and evolution violates the laws of physics that govern liquids, solids, and gases. The second law of thermodynamics states that a cube of sugar cube will dissolve in a cup of coffee and that a gas will fill up the entire container it is in. In thermodynamics, physicists calculate the probability that sugar molecules in a cup of coffee will drift towards some point and re-create a sugar cube. Hence, the existence of proteins violates the second law of thermodynamics, according to people who don’t understand thermodynamics. This thinking shows a lack of understanding of the two probability calculations. There is nothing improbable about proteins. They exist. The probability calculations of physicists, however, are quite real. There is a real chance that a cup of coffee will lose it sweetness because of the random drift of sugar molecules. Also, the second law of thermodynamics concerns the location of molecules in three-dimensional space. The location of amino acids in a protein concerns which amino acid is next to which. It does not concern three-dimensional space. In my letter to Yvette Clarke (D-NY, 9th district), I discuss this in more detail and I give references to support some of the statements I made. Richard Dawkins ridicules creationists for saying evolution violated the second law of thermodynamics in The Greatest Show on Earth: Evidence for Evolution. However, he does not refute this correctly by saying that the second law of thermodynamics does not apply to biological systems and to the evolution of stars. He says evolution does not violate the second law because of the sun. This is literally unintelligible, and proves that Dawkins is neurotic about religion. The thought that evolution violates the second law fills him with so much anxiety that he can’t think rationally. Starting in May 2010, I was blogging and ridiculing Dawkins and other atheists in this way when Glenn Branch, the communications director of the National Center for Science Education, told me about the article titled “Entropy and evolution” published by the American Journal of Physics (Vol. 78, No.11, Nov. 2008). (The second law is that entropy always increases; entropy is a variable related to temperature and heat and has the units joules/degree.) The article says exactly the same thing Dawkins says. It also backs it up with a calculation of entropy changes during evolution. The calculation is absurd because it misuses the Boltzmann equation for entropy. I emailed Emory Bunn (U. of Richmond) who wrote a note that “improved” on the calculation. I told him about the error, and he said he didn’t want to discuss it. I then told the editor of the AJP, David Jackson (Dickinson College), who suggested I submit my own article. I told Burton Budick (New York University), where I got a Ph.D. in Physics in 1971, that I needed help. He gave me the email address of Robert Richardson (New York University). In my email, I told Dr. Richardson about the way the Boltzmann equation was used with the question: Am I right? I interpreted his response to mean I was right, and sent him the article with my analysis. His response was most shocking. He said there was nothing he could do for me and that he doubted I could afford his fee ($400 per hour.) My guess is that he found out from Burton that I was a retired high school teacher and was trying to insult me. I then submitted an article to the AJP and an anonymous reviewer said that my submission had no merit. In the meantime, the newsletter of the Catholic Truth of Scotland published my analysis of the article, as did Creationwiki.org. I figured Dr. Richardson was an atheist and the AJP did not want to admit that it made a mistake. I soon found out that the matter is much more difficult than this to understand. Stephen Barr (U. of Delware) is a prominent Catholic physicist who writes about evolution. I told him about my article in the Catholic Truth of Scotland in an email. He responded very angrily that I was mistaken and was harming the Catholic Church. He was obviously being sincere because he did not have to answer my email. My response was to accuse him of not reading the article, and I demanded an apology. I think he is the crazy one, not me, because he did not write to the Catholic Truth of Scotland to explain why I was wrong. Barr is a member of the Academy of Catholic Theology, and I wrote to many of the members saying they should kick Barr out of the Academy for being dishonest. I contacted a number of Jesuit priests connected to Barr, and they are all helping the AJP cover up its mistake in publishing the article. I filed a complaint against these Jesuit with the Vatican. Of particular interest to you should be my complaint against Fr. Nicano Austriaco (Providence College) because I met with Fr. Brian Mulcahy (212-737-5757; the President of Providence College Corporation) on September 9, 2013. I explained to Fr. Mulcahy that Fr. Austriaco was a liar, and Fr. Mulcahy promised to confront Fr. Austriaco, but he never got back to me about what happened. I filed a complaint against Fr. Mulcahy with his superior in the Dominican Order. If I am in need of psychiatric care or am sinning, Fr. Mulcahy should tell my pastor at the Church of Notre Dame. Randy Isaac is another physicist who behaved just like Barr. He is the executive director of the American Scientific Affiliation, a Christian organization. I was a member of that organization and was explaining on its forum why the AJP article should be retracted. Randy promised to “walk me through the second law of thermodynamics.” We started the exchange and his comments quickly became inane. For example, I said: A Boeing 747 does not have a temperature. He said: Yes, it does. I asked Robert Kaita, the president of the ASA, to assign a moderator. I consider the fact that no moderator was assigned as proof that Randy Isaac and Robert Kaita know perfectly well that the AJP article should be retracted. After complaining to the American Institute of Physics, the American Association of Physics Teachers, the American Association for the Advancement of Science, and the National Science Foundation, I filed a complaint with Yvette Clarke, my congressman. Initially her communications director refused to be my advocate. But when he saw my analysis with 10 steps and 9 exhibits, he told me it would be investigated. I confirmed this with a letter mailed with a certificate of mailing. I have sent out hundreds of emails and faxes to physics departments and others saying the House of Representatives is investigating the American Journal of Physic article. I also submitted two articles about this to Zygon: The Journal of Religion and Science. The editor rejected both of them for reasons just as dishonest as the reasons given by the American Journal of Physics. I then complained to all of the editorial advisors to Zygon, one of whom writes for Al Jazeera. I told Al Jazeera about Congress’s investigation, and it occurred to me that the AJP article is evidence indeed that American is the “Great Satan.” This article and the culture war about evolution has an impact on our foreign relations and national security. I told Robert Nelson, Advisor to Assistant Secretary of State Rose Gottemoeller, about this threat to our security in a LinkedIn InMail on 3/11/14. There was no response, so asked for an appointment to see Gottemoeller. I’v been dealing with Matthew Hoppler, her assistant, who told me that Gottemoeller is considering my request for an interview. Most of the interactions I’v described are on my blog at http://newevangelist.me/. I also sent some faxes to this number on 4/7/14 after discussing it with someone. I confirmed on 4/8/14 that you got the faxes, which describe some other interactions that I’v had. On 4/18/2014, I filed a complaint on the Homeland Security Investigations Tip Line against Rose Gottemoeller, Under Secretary of State for Arms Control and International Security, and her science advisor Ronald Nelson for their reaction to the information I gave them concerning America’s security and foreign relations. I want to meet with a member of your team in person to explain what I am concerned about. I hope you accept the challenge I explained to you at yesterday’s reception of getting the American Journal of Physics to retract the divisive article about evolution and thermodynamics. As you well know, thermodynamics is the study of solids, liquids, and gases, and has nothing to do with the evolution of stars or living organisms. The culture war about evolution is currently raising its ugly head at Ball State University where a professor of science is advocating the theory of intelligent design. A previous occurrence was reported in a 29-page congressional document titled, “Intolerance and the Politicization of Science at the Smithsonian: Smithsonian’s Top Officials Permit the Demotion and Harassment of Scientist Skeptical of Darwinian Evolution” (December 2006). A retraction will constitute an admission that the scientific establishment in the United States is capable of being irrational about evolution. This might inspire advocates of intelligent design to stop promoting their irrational ideas about evolution. We know that God exists because we are embodied spirits and because we are hoping or assuming the universe is intelligible. In my opinion, evolution is evidence that God does not exist because it is evidence that the universe is not intelligible. Evolution is, however, a reason to believe in the Bible because the Bible says God created the universe from nothing. I recently sent Senator Kirsten Gillibrand a privacy release form in the expectation she will assign a caseworker for this scandal that involves the National Science Foundation, Department of Homeland Security, and the Department of State. Step 1: Contact Yvette Clarke (D-NY, 9th district) and inquire about the status of the congressional investigation of the AJP article. My correspondence with the NSF, Congressman Clarke, and Rush Holt (D-NJ, 12th district) is at http://newevangelist.me/2013/04/12/national-science-foundation/. Congressman Holt has a Ph.D. in physics from New York University, which is where I got my Ph.D. in physics. My discussions with the Under Secretary of State for Arms Control and International Security have been with Matthew Hoppler, who works in her office. If I don’t hear from you in a week, I’ll file a complaint against Senator Gillibrand with the U. S. Senate Select Committee on Ethics. I am faxing the certificate of mailing of the letter I faxed to Sen. Gillibrand on May 16, 2014, and her privacy release form to prove her involvement in the scandal of a peer-reviewed physics article promoting atheistic nonsense about thermodynamics (the study of liquids, solids, and gases) and biological evolution. The new director (France Córdova) of the National Science Foundation is a physicist. The knee-jerk reaction of physicists to the idea that evolution violates the second law of thermodynamics is that the law only applies to isolated systems. All it takes to correct this mistake is to ask the question: Does the evolution of stars violate the second law of thermodynamics? A physicist will realize immediately that the second law does not apply to the evolution of stars and biological evolution. This letter is a formal request for a personal appointment with you to explain why Sen. Gillibrand’s behavior is unethical. I’v faxed this letter as well as the letter to Sen. Gillibrand to Dr. Córdova. Senator Gillibrand has received your request for assistance regarding your concerns with the American Journal of Physics. The Senator appreciates the trust and confidence that your request represents; however, we are unable to influence the publication, amendment, or redaction of articles appearing in peer reviewed scientific journals. Insofar as the staff of Rep. Yvette Clarke's office has expressed a willingness to assist you, please contact them directly. Please be assured that your request has received a through review, and it is our hope that your matter can be resolved to your satisfaction as soon as possible. Re: Ethics Complaint Against Sen. Gillibrand faxed to your office on April 7 and May 16, 19, and 21. In the accompanying fax, Sen. Gillibrand states she reviewed the material I submitted about “Entropy and evolution,” (American Journal of Physics, November 2008). In fact, her staff refused my request to explain the matter to them in person. In a nutshell, I am accusing the American scientific establishment of engaging in pseudoscience to promote atheism. The article undermines the integrity of science, exacerbates the controversy about the teaching of evolution, and interferes with our relationships with other nations. There is no way her staff could have investigated such an allegation without interviewing me. Sen. Gillibrand also suggests that I contact Congressman Yvette Clarke (D-NY, 9th district). Congressman Clarke has already agreed to investigate my complaint against the American Journal of Physics and the National Science Foundation. My correspondence with Congressman Clarke and Congressman Rush Holt (D- NJ, 12th district) is on my blog (http://newevangelist.me/2013/04/12/national-science-foundation/). Congressman Holt has a Ph.D. in physics from New York University. I asked Sen. Gillibrand for help in my request to see Under Secretary of State for Arms Control and International Security (Rose Gottemoeller) and the Secretary of Homeland Security (Jeh Johnson) about the negative impact the absurd article might have on American security and foreign relations. I was told that the Under Secretary was considering my request for an appointment. I have not gotten any response from Mr. Johnson. I suggest reading Evolution Revolution: Evolution is True. Darwin is Wrong. This Changes Everything by Alan Bennett. This book exposes the anti-religion cult of Darwinism that many mainstream evolutionary biologists either follow or are browbeaten into following. Faxed to Phillip Sharp (American Association for the Advancement of Science), Beth Cunningham (American Association of Physics Teachers), John Haynes (American Institute of Physics), France Cordova (National Science Foundation), Yvette Clarke (D-NY, 9th district), Rush Holt (D-NJ, 12th district), Mariette DiChristina (Scientific American), Neil DeGrasse Tyson (Hayden Planetarium), David Ciancimino (New York Province of the Society of Jesus), John Sexton (New York University), Julie Schmid (American Association University Professors), and Willem Drees (Zygon: Journal of Religion and Science). I faxed my letter to you dated June 8, 2014, and Senator Gillibrand’s letter to me dated June 2, 2014 to hundreds of physicists and biologists. I edited the accompanying call log of my fax service, and included only the faxes that were sent. Re: Ethics Complaint Against Sen. Gillibrand faxed to your office on April 7; May 16, 19, and 21; June 8, and 16. I just got your letter dated June 2 dismissing my complaint. I am requesting that you reconsider this decision for the reasons set forth in my letters to you dated June 8 and June 16, which were rebuttals of the June 2 letter I got from Sen. Gillibrand. My criticism of Sen. Gillibrand and her staff is that they refused my request to explain in person why pressure should be put on the American Journal of Physics to retract the article about evolution. If you dismiss my complaint without letting me present my case, you will be guilty of the same unethical conduct as Sen. Gillibrand. I am willing to pay for my transportation to Washington, D.C. If you and your staff refuse this request for a meeting, I will file a complaint against you with the D.C. Bar. If you and your staff do meet with me, the D.C. Bar will not be in the loop and your “disciplinary history” will remain unblemished. On June 18, 2014, I faxed a letter to your office requesting an appointment and saying I would file a complaint against you with the D.C. Bar for unethical conduct for dismissing my complaint against Sen. Gillibrand. Some time ago, I filed a lawsuit that was dismissed because there was no cause of action. This decision was just if the writing and reading skills of all involved were sufficient. However, I appealed and explained the case to a judge in person. This is the basis of my belief that due process of law requires face-to-face meetings. The decision against me was just because the judge took full responsibility for dismissing my case. I feel that if you do not accept my request for a personal meeting with you, you will be behaving unethically. It is as if the judge in my case turned off his hearing aid when I was talking. My accusation is that you are replicating the unethical behavior of Sen. Gillibrand. Sen. Gillibrand’s dereliction of duty is her unwillingness to investigate the behavior of Rose Gottermoeller (Under Secretary for Arms Control and International Security) and her science advisor, Robert Nelson. 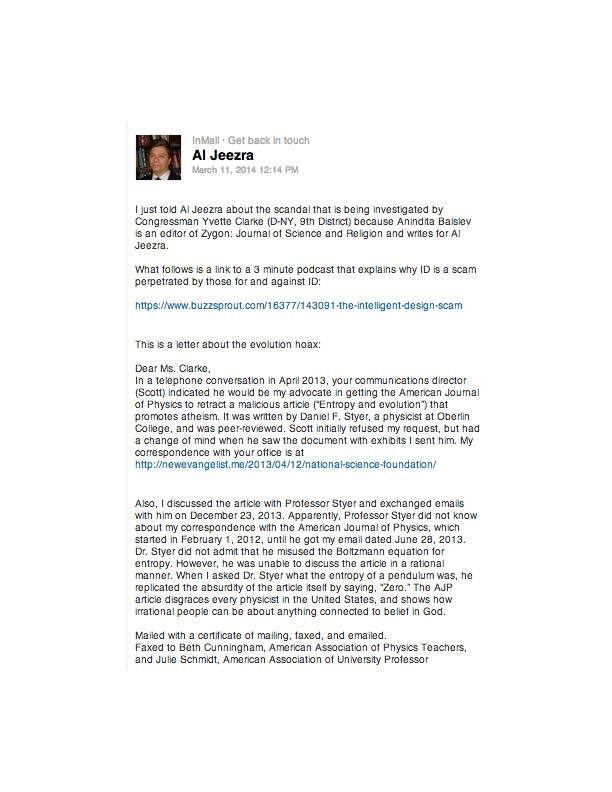 On March 11, 2014, I sent a LinkedIn message to Dr. Nelson telling about Rep. Yvette Clark’s investigation of “Entropy and evolution,” (Am. J. Phys., Vol. 76, No. 11, November 2008). The article is atheistic pseudoscience, and can have a negative effect on our foreign relations and security. Nelson and Gottermoeller are no doubt mindful of the culture war in the United States about evolution. Scientists at the Smithsonian Institute behaved like a Nazi mob towards one of their colleagues for publishing a review article (“The origin of biological information and the higher taxonomic categories”) because the author (Richard Sternberg) plugged the theory of intelligent design (ID). The peer-reviewers considered the reference to ID a harmless philosophical addendum that did not detract from the scientific value of the paper. (See the 29-page congressional document titled, “Intolerance and the Politicization of Science at the Smithsonian: Smithsonian’s Top Officials Permit the Demotion and Harassment of Scientist Skeptical of Darwinian Evolution,” December 2006). If the American Journal of Physics retracts the absurd article, it will be a victory for people that are “Skeptical of Darwinian Evolution” and a loss for atheists. This is why Dr. Nelson ignored my LinkedIn message. He could not defend the article, but he dared not agree that the article should be retracted. The Committee on Ethics, Rose Gottemoeller, and Kirstin Gillibrand are simply following Dr. Nelson’s dishonorable lead with the same cowardly motives. The DC Bar complaint form asks “Have you filed a complaint about this matter elsewhere?” The answer is that I filed the complaint with Rep. Yvette Clarke and that the matter is under investigation. Thank you for discussing this case with me. As I said, it was not my intention to file a complaint against Mr. Sassaman. I was threatening Mr. Sassaman with this if he did not meet with me personally so that I could explain my ethical complaint against Sen. Gillibrand. Since your office has started a file and assigned a case number, I think my communications should be with your office, unless you tell me otherwise. Mr. Sassaman’s staff told me they would respond to my request for a meeting with Mr. Sassaman in 30 days, which would be July 18, 2014. This American scandal began when I was blogging about Richard Dawkins’ latest book about evolution in which he ridicules creationists for saying that biological evolution violated the second law of thermodynamics. Dawkins is one of the new atheists, so I was delighted to be able to ridicule Dawkins for not understanding thermodynamics, which has nothing to do with the evolution of stars or biological evolution. Juxtaposing evolution and the science of liquids, solids, and gases is a common mistake that anyone could make. Dawkins comments, however, were unintelligible. Glenn Branch, communications director of the National Center for Science Education, squelched me by citing a peer-reviewed article published by the American Journal of Physics (“Entropy and evolution”) saying exactly what Dawkins said and backing it up with a calculation. I explained to one of the authors (Emory Bunn) that the calculation made no sense, and he told me he did not want to discuss the matter. I then told the editor (David Jackson) about the error, and he suggested that I submit an article of rebuttal. I did so, and an anonymous reviewer said I was wrong. In this way, the AJP avoided taking responsibility for the article. I complained to the National Science Foundation that the article undermines the integrity of science and exacerbate the culture war in the United States about the teaching of evolution. I then sent a letter to Yvette Clarke (D-NY, 9th District), and asked her communications director (Scott) to make an appointment for me to see her. He refused on the grounds that he could not be my advocate to that extent. I then sent more information with many exhibits. Scott changed his mind. He said that Yvette Clarke would investigate my allegation against the AJP. I think you should tell Mr. Sassaman that you are involved in this matter. If Mr. Sassaman refuses to meet with me, and Gene refuses to sanction him, I’ll be asking to see Gene. I’m not at my regular computer. When I get there, I’ll fax you my communications with Mr. Sassaman and Senator Gillibrand. I sent you an email concerning my campaign to get the American Journal of Physics to retract an absurd article about evolution that exacerbates the conflict in the United States about the teaching of evolution and undermines the integrity of science in the United States. I believe my congressman, Yvette Clarke (D-NY, 9th district), investigated this matter or forwarded the issue to the Subcommittee on Research and Technology. I am writing to ask you to contact Rep. Clarke and find out the status of the investigation. I am willing to travel to Washington DC, at my own expense, to explain this entire matter to you.